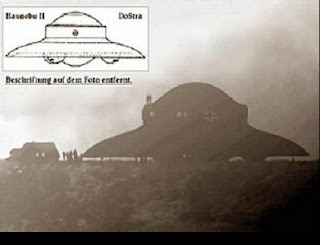 The old 'Nazi UFO' meme is floating around again. Dave Emory's been taking about it for ages, never failing to toss in his "green-eyed aliens from Uranus" joke that just gets funnier every time he repeats it (and he's been doing so as long as I can remember). It's all part of his Robert Ludlum-like master conspiracy theory of Germany taking over while the rest of the major world powers look on helplessly. Emory does excellent research, but his analysis? I don't know. 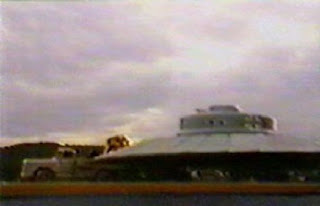 In Roswell and the Reich alternative science and history researcher Joseph P Farrell presents a very different scenario of what crashed in Roswell, New Mexico in July 1947, and why the U.S. military has continued its cover-up to this day. By means of a meticulous review of the best-known Roswell research from both UFO-ET advocates and skeptics alike, as well as some not-so-well known Roswell research, Farrell presents a fascinating case sure to disturb both ET believer and skeptic alike, namely, that what crashed may have been representative of an independent postwar Nazi power, an extraterritorial Reich monitoring its old enemy, America, and its continuing developments of the very technologies it confiscated from Germany at the end of the war. Hoagland's been on the case too, writing this in his massive Norway Spiral piece, namechecking Richard Dolan, whose video we watched here a few months back. Hoagland claims that the secret space program is actually a secret Nazi army flexing its muscles to the big world powers. 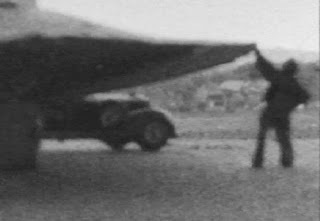 Secondly, there is no historical evidence – physical or photographic – of the supposed flying discs. We are repeatedly told of craft of immense power, and sometimes immense size, defying all scientific parameters known before or since. Yet not so much as a bolt or a tachyon drive remains to verify their existence. There are just the oft-reproduced, fuzzy post-war photos taken by those who wished to convince us of saucer reality, but who usually succeeded only in demonstrating the unexplored potential of domestic containers and the art of close-up photography. 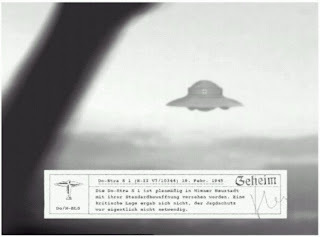 The first sightings occurred in November 1944, when pilots flying over Germany by night reported seeing fast-moving round glowing objects following their aircraft. The objects were variously described as fiery, and glowing red, white, or orange. Some pilots described them as resembling Christmas tree lights and reported that they seemed to toy with the aircraft, making wild turns before simply vanishing. Pilots and aircrew reported that the objects flew formation with their aircraft and behaved as if under intelligent control, but never displayed hostile behavior. If these were German aircraft defending the Fatherland, then why wouldn't they display hostile behavior? These foo fighters sound a lot more like the objects we've seen chasing the space shuttle around (which strike me as some kind of surveillance drone, rightly or wrongly). Those too could be part of the secret Nazi space program, but I'm not really feeling it. Now, we have seen a lot of photos that look like they're of German provenance, but the funny thing is that most of the "craft" look like something out of an Ed Wood movie. And, oh yeah, most of them aren't flying. And the ones we see flying are obvious fakes. The ones we see on the ground don't match the ones in the air, and there seem to be way too many different models on offer to boot. Which would make sense if it was all smoke and mirrors, not so much if it were a real weapons program at a time when most of Germany's factories were rubble. So how and why were these photos made? I'd suggest two possibilities. 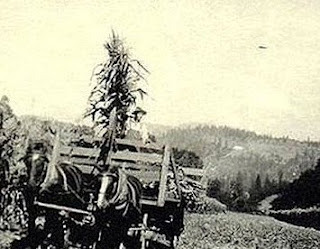 First- we know of all kinds of propaganda gambits during the war (the Allies even made inflatable scale models of airplanes to throw German recon off) and it could be that the Germans wanted the Allies to believe that they'd mastered this technology that had been seen in the sky for centuries, or perhaps had cut a deal with the saucer men themselves. Classic psych-out propaganda. 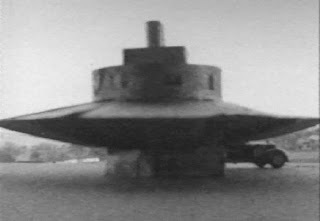 Or it could also be that the Brits or the US faked it all long after the fact to create doubt in the minds of the public in the wake of the saucers scares- particularly in the wake of the Washington flyovers in 1952. Joe Sixpack would sleep easier knowing the saucers were birds we stole from the Jerries and were fixing to use on the Reds, than if he thought the saucers were alien and there wasn't a damn thing Uncle Sam could do about it. I'm sure we've got a lot of exotic flying tech up there, but how exotic I'm not sure. Call me crazy, but I still think that something that wasn't ours could well have come down at Roswell and that might account for the transistor and all sorts of other new toys hitting the market not long after. It's a funny thing, a lot of people will believe pretty much anything before they believe that there could be non-human intelligences flying around up there for reasons unknown to us. I've never understood it but there are a lot of people who just can't deal with the possibility of ET. And it's usually people who like to fancy themselves as smarter than everyone else.